We are pleased to announce that we have been ranked 43rd in The Drum’s Top 100 UK Design Agencies and 4th in the East Midlands. 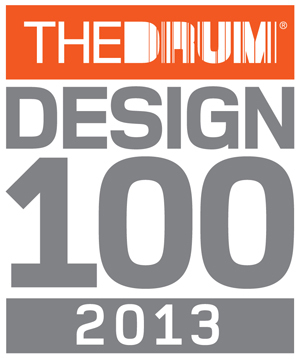 The Drum’s Design 100 offers a comprehensive financial review of the 100 top-performing agencies in the UK design industry. As well as ranking highly in the top 100 for our financial credentials – we came 6th in the Client Poll for Value For Money! We have just completed our first project for Saint-Gobain, world leaders in design, production and distribution of construction materials, delivering innovative products and services. 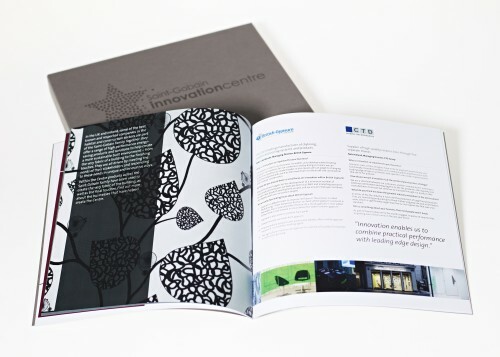 We were delighted to have been invited to design and produce a limited edition book to celebrate the opening of Saint-Gobain’s Innovation Centre. The Innovation Centre showcases innovative and sustainable products and services within the construction industry, helps to raise the profile of Saint-Gobain and exemplifies their strategic focus: to be the reference for sustainable habitat. The book needed to be of highest quality and was designed as a ‘keep-sake’ to be enjoyed by the VIPs attending the launch event. 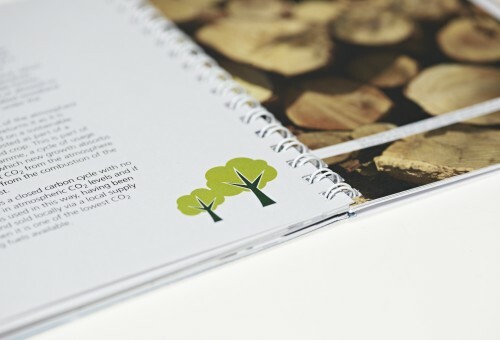 The book was 260mm square, 24 pages and printed on Fedrigoni Sirio Pietra stock – a perfect match to Saint-Gobain’s corporate colour – PMS 423. It included large images and full pages of block colour to break up the text, bracket graphics throughout were used as a linking device between relating features (i.e. a quote and an image) and there is a double page timeline to visually represent Saint-Gobain’s 350 year history of innovation. 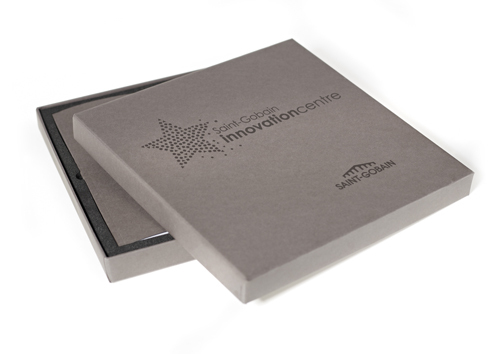 The cover of the book was simple yet effective with a UV Spot title and the Innovation Centre logo and each book was personalised with a limited edition number – highlighting the limited print run and emphasising the exclusivity of the book. The book was displayed in a presentation box with a black foam inner to hold a branded USB stick and the book. We turned this project around – from receiving the brief to delivering the finished article – in just four weeks (which included digesting the guidelines which were new to us), in time for their VIP launch event last week. The objective of Heathrow’s low-carbon strategy is to reduce emissions across the airport – the Energy Centre is a new facility which is set to play a significant role in doing so. We have created an A6, 42 page, spiral bound familiarisation booklet for internal stakeholders which introduces them to the Energy Centre. The brief was to create a ‘handy’ reference booklet full of information that can be conveniently absorbed by the reader. The booklet, which includes safety information, access details and operational essentials, has been designed to be tangible, practical and accessible to all. 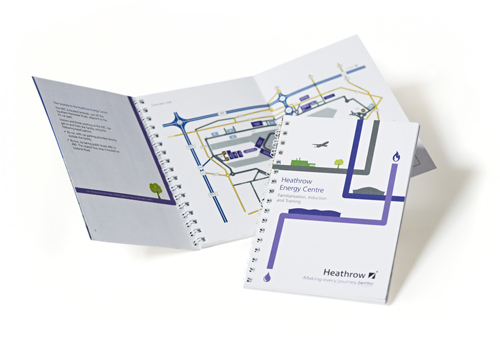 A pipe work illustration, which represents the pipe work that carries hot water around the airport, guides the reader through the booklet. There are illustrations to add interest to each page and key facts and figures travelling around the pipe work illustrations to highlight important information. Fold out pages show the process diagram which visually describes the workings of the Energy Centre and compliments the copy.